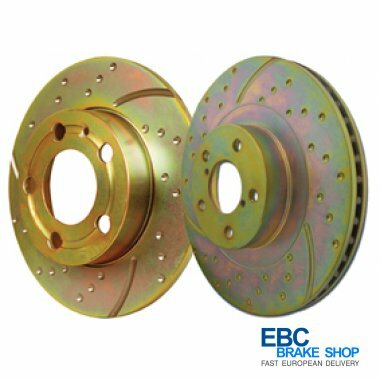 EBCs Turbo Groove Brake Discs feature a slot design that runs to the outside edge of the disc allowing the dust, debris, gasses and carbon deposits to be spun off from the braking disc surface, further improving braking. The blind holes prevent cracking and help to break down surface gasses of the brake disc/rotor to further improve braking under heavy load. Made in Europe and machined using a high quality alloy that is capable of running up to incredibly high temperature. These discs are intended for Road, light race, rally and track day use. When used with Greenstuff, Redstuff Ceramic or Yellowstuff brakepads, you will be hard pressed to find a better priced and quality standard sized disc/pad combo for your car.